On February 9th, Joshua Liner Gallery will present fresh work from Evan Hecox collectively entitled The Long Way. 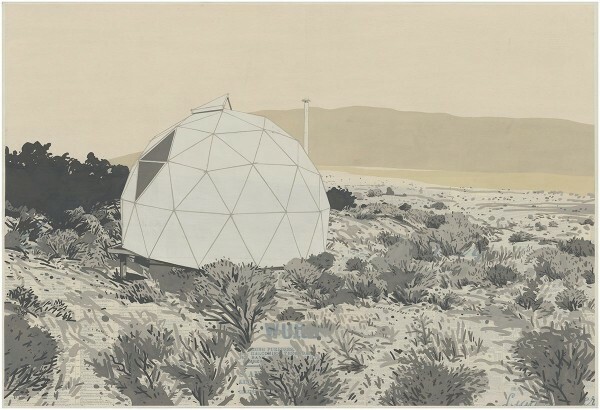 His fourth solo with the New York showpace features a set of fifteen new works on paper inspired by a recent road trip through the Southwestern region (documented in the video below) where he encountered desert landscapes, Taos Earthships, The Rio Grande Gorge, lonesome church ruins and Dennis Hopper’s grave. The new pieces feature elements often seen in the Denver-based artist’s oeuvre – typography, geometric shapes, collaging – but also sees Hecox using a more reductive and abstract technique than in the past. Categories: Contemporary Art, Shows & Events, Videos. Tags: Contemporary Art, Evan Hecox, New York, Shows & Events, Videos.